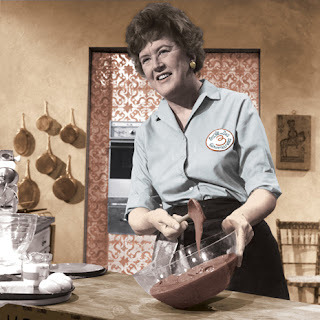 Each year, on August 14, the calendar on my computer reminds me it's Julia Child’s birthday. Does that seem strange? For most foodies, probably not. We owe a lot to this culinary maverick, who brought one of the world’s most delicious and famous cuisines to the American kitchen. She also made it okay to fail, as long as you try again. As she reminded us, we are often alone in the kitchen, so who’s going to know. I've watched Julia’s television shows all my life. 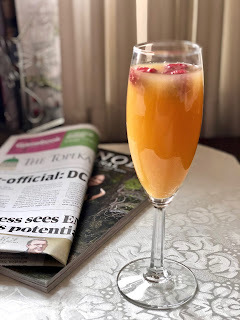 However, she became my hero when I discovered she began her culinary journey at age 37, which was about the same age I was when I ventured out into my writing career. Her success allowed me to put aside my fears and believe it is never to late to follow your dreams and build the life you desire. Now, years later, I have my Julia Life: I’m a full-time freelance writer. I’m married to my version of Paul Child, my husband Michael, who loves me and encourages me to follow my dreams. (It is such a gift to have a husband who says, “I’m so proud of you” on a regular basis.) I've created dishes that make me close my eyes in rapturous delight. Yes, I still have goals and dreams ahead (my first published book being at the top of my list), but I’m so happy and blessed to be living The Julia Life. “Good results require that one take time and care. If one doesn't use the freshest ingredients or read the whole recipe before starting, and if one rushes through the cooking, the result will be an inferior taste and texture—a gummy beef Wellington, say. But a careful approach will result in a magnificent burst of flavor, a thoroughly satisfying meal, perhaps even a life-changing experience.” –Julia Child, from My Life in France. Dear Linda, I hope your weekend was everything you dreamed. It is nice to have these plans to look forward to. I like all of your favorite Julia dishes. Julia does give up inspiration that it is never too late to catch your dream. Well done on switching careers with such success, Linda. Long may you continue living the life and creating dishes that send you into raptures. I couldn't agree more with Julia's advice about choosing the freshest of ingredients, and reading the recipe. Louise linked to your blog, and I liked that you and I are doing the same thing: a return to Julia! I recently made her ratattouille and boeuf bourginon. She never disappoints. Thanks for visiting, Mae. I'll be sure to check out your blog. Karen, it is a lovely and delicious life. Mary, slowly but surly I keep moving along!